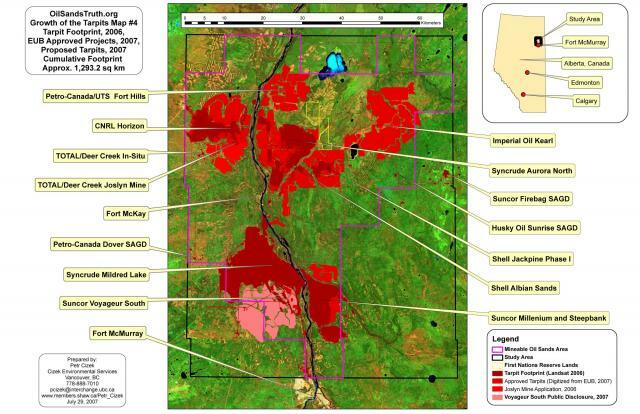 Map #4 shows the existing physical footprint of the tarpits in dark red, the approved tarpit projects in red, combined with the TOTAL/Deer Creek Joslyn Mine project application in light red and the Suncor Voyageur South public disclosure in pink. Since this map was prepared, Suncor Voyageur South has also become a formal application. The combined (cumulative) physical physical footprint of all the existing, approved, and proposed tarpits would be about 1,293.2 square km or over twice the current built-up (urbanized) area of the City of Calgary.